we all loved her hair! I will send you the professional photos soon!" Catrina wrote: "You are such a clever lady x x"
"Great makeup Make Up Artist Phuket!!!" but I'll shoot you an email pleading for recommendations if we ever come back. Thanks so much for your service and professionalism, you made planning this part of the wedding a breeze! Ally wrote:"Oh, you are amazing. You did a great job. Thank you so much. I will definitely recommend you to my friends." 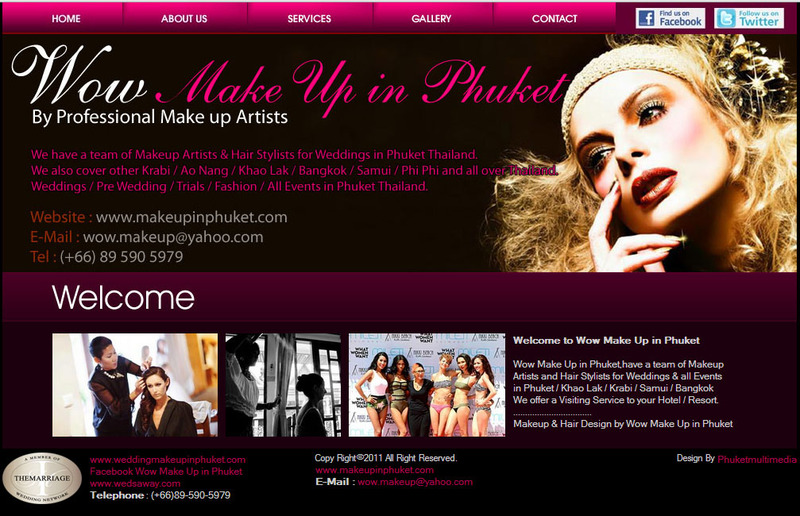 "Just wanted to say a big THANK YOU to Geoff, Oh and Bee from Wow Make up in Phuket. from thousands of miles away but Geoff again was very prompt in answering any questions we had and put to rest any of those worries. approachable and listened to my wife’s requirements. They were very humble and made everyone feel really special. Oh did an excellent job with my wife’s hair and make-up and she was really happy. We can’t say a bad word about either of them. Wow Make Up in PHUKET are certainly the best I found. I highly recommend them." it was absolutely amazing and I would more then recommend you to anyone needing their hair and make up done. It was such a stress free experience for my big day.Thanks again,"
Eileen wrote: "Thank you so much Khun Oh and Geoff, we love Khun Oh, she is amazing." "I LOVE your work Oh!! Thanks so much. The bridesmaid and other ladies are excited now about having their makeup done by you this week." "I would just like to say thankyou to Oh and the team.The Makeup and Hair was amazing. The Bridesmaids are pickyand they loved the hair & makeup." "Oh is a talented Makeup Artist.Thankyou for a memorable Wedding." "Thankyou so much for all your efforts into making us look gorgeous on the day"
"Oh did an amazing job,we feel lucky to have found her." for our 1st wedding anniversary when we come back next year." and my girls feel and look amazing.Would recommend you without hesitation." "I was so pleased with how it all worked out,Thankyou so much"
"Oh did a fantastic job she was there all day,what a champion"
"The girls were thrilled with Oh's work"
"Thanks for the AMAZING hair and makeup,it was perfect and exceeded all my expectations and vision. and feel truly beautiful for any occasion." wish you lived in Australia"
"Oh and the team are excellent,it is so nice to find a proper H & MUA on Samui"
"Thankyou for the amazing job,you were excellent"
"You did such a good job,you made us feel so special for the day"
"Thanks Oh and the team,you were wonderful"
"Everyone liked the h&m,thankyou to all the artists"
"Contacting you was a great choice,all my family members were full of praise for Oh"
"The Wedding was perfect,we will recommend you to all our customers"
"Everyone loves Oh and thankyou for the prompt emails"
it literally disappeared as I could not spot it in any of the wedding pictures"
"Oh you are the best H&M Artist we can ask for,thankyou so much"
"Good job yesterday,the customer was very happy"
"Fab work on Erica and her group"
I will recommend your website to my beloved friends and family"
"Thankyou so much Oh,my wife looked stunning I will never forget our wedding day"
"I wish I could carry you around in my pocket,to give me a boost when I need it"
"You are my favourite Makeup Artist"
"All the ladies looked gorgeous"
"Thank you very much for the nice job"
"I liked the H&M very much"
"Oh and her team did an amazing job,will definitely spread the word"
"Everyone loved the H&M,we`re very happy with your service"
she really went out of her way despite not feeling one hundred percent. I will definitely be recommending your services to others"
"Thank you for doing my Hair and Makeup,Oh did an amazing job.We loved it.Thank you"
"Wow Make Up in Phuket were excellent,quick email replies,very reliable and reasonably priced. I wouldn`t hesitate to recommend them to anyone"
I will definitely recommend you to any friends who may have a wedding in Thailand"
so when I met you it was like having a celebrity Makeup Artist"
"The Best Make Up Artist,the amazing Oh"
"It was a pleasure working with you,Oh was absolutely fabulous. I will definitely recommend Wow to everyone"